Come and chill out under New York's biggest bouquet! The poetical and ecological approach in Izaskun Chinchilla's participatory project of the Organic Growth Pavilion distinguishes this original, colorful and mixed media video, that narrates the design concept. A combination of live-footage frames, photomontages, collages, graphic elements and drawings - sometimes overlapped - explores the idea of a temporary installation that is conceived both as a living being and a shared oasis to chill out in the midst of the city: the low cost, highly sustainable and multifaceted configuration of the summer pavilion is inspired by the growing and morphing ability of trees and hydrangea flowers' structures and is designed to as to adapt to uncertain budgets as well as to different social and ecological dynamics. This "cradle-to-cradle" design approach learns from nature an important lesson of flexibility and responsiveness and the aptitude to always find a balance with the surrounding environment. 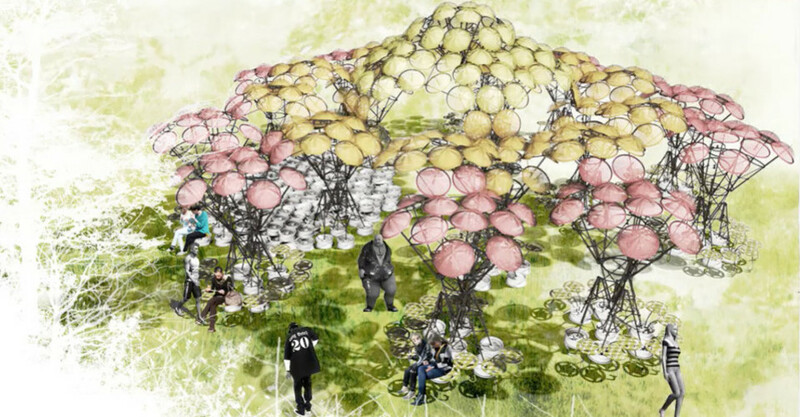 The dome-shaped canopy of branches of the designed installation is made out of recycled materials and donated elements - such as forgotten umbrellas, used photographer tripods, old bike wheels - that can be easily and quickly built up and dismantled even in self supported smaller units and then placed in different locations. By exploring a prototype and the drawings of Izaskun Chinchilla' design, the "Organic Growth" video suggests possible scenarios related to its future construction. The project is one of the winning entries of the 2015 International "City of Dreams" Pavilion Competition in New York, run by the cultural organization Figment, the AIA's Emerging New York Architects Committee and the Structural Engineers Association of New York in order to imagine a future of the city "where anything is possible". The design team led by Izaskun Chinchilla - tutor at the Bartlett MArch Architecture Unit 22 - launched a Kickstarter campaign and spread it through the social media to cover the costs of assembly of their installation on Governors Island. Also, they involved the community directly in the construction of their pavilion, that is schedule for completion by summer 2015.